There's a program on CBS tonight I think is really worth watching. It's called "Flashpoint," and it's the story of one explosion in the city of Baghdad. One IED that ended the lives of three people also changed the lives of many more. That one explosion killed Army Capt. James Funkhauser. 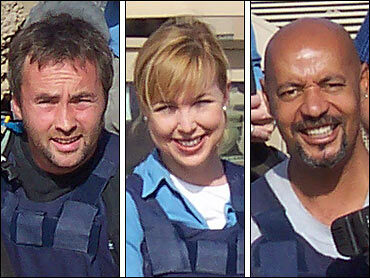 It also killed our CBS colleagues Paul Douglas and James Brolan. Correspondent Kimberly Dozier almost died that day, and several members of the squad from the Fourth Infantry Division who were on that patrol were wounded as well. We hear from the doctor who no doubt saved Kimberly's life, and we hear from the widows of Douglas and Funkhauser, who are trying to make sense of living without the men they loved. We meet the guys who lost their commanding officer — guys who feel guilty about surviving. Most of the casualties from the war in Iraq come from IEDs. "Flashpoint" helps us understand just what that means.